Volkswagen is a car company from Germany. 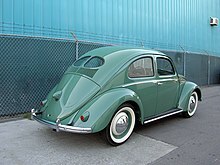 The word volkswagen means "People's car" in German. Its headquarters are in Wolfsburg, Lower Saxony. It was started in the 1930s, at the request of the country's leader, Adolf Hitler to produce a car designed by Ferdinand Porsche. Volkswagen is currently involved in an emissions test scandal. ↑ 1.0 1.1 Nelson, Walter (1967). Small Wonder. Little, Brown & Company. p. 333. ↑ Hotten, Russell (10 December 2015). "Volkswagen: The scandal explained" – via www.bbc.co.uk. This page was last changed on 22 April 2019, at 15:33.